The key to the efficient transmission and conversion of low-carbon electrical energy is the improvement of power electronic devices. Diamond is considered to be the ultimate wide bandgap semiconductor material for applications in high power electronics due to its exceptional thermal and electronic properties. Two recent developments – the emergence of commercially available electronic grade single crystals and a scientific breakthrough in creating a MOS channel in diamond technology, have now opened new opportunities for the fabrication and commercialisation of diamond power transistors. These will result in substantial improvements in the performance of power electronic systems by offering higher blocking voltages, improved efficiency and reliability, as well as reduced thermal requirements thus opening the door to more efficient green electronic systems. First GreenDiamond Thesis: Gaetan Perez is presenting his thesis in Grenoble! Diamond is considered as the ultimate semiconductor for power electronics applications. Even though diamond semiconductor devices have been realised worldwide, they are still prototypes or proof of concept devices. It is however necessary to understand how they operate for full use of their benefits in power converters. In this thesis, we focused the analysis on pseudo-vertical diamond Schottky diodes. Firstly, static and switching characterisations were achieved. They allowed us to extract device characteristics to integrate them in power converters and analyse their switching abilities. Management of diodes in power converters was then studied. These studies allowed us to propose device structure modifications to improve diode performance and their integration in power converters. 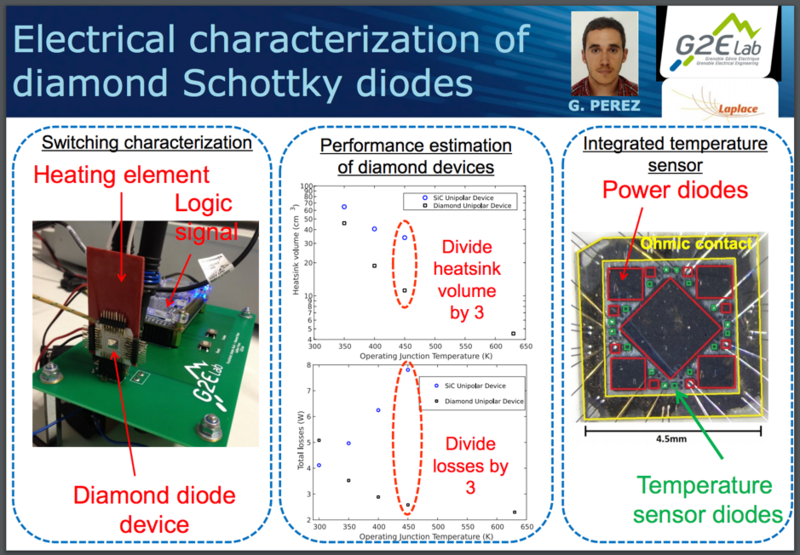 Finally, a theoretical analysis of a diamond Schottky diode performance in a power converter was performed, with comparison to the performances of a SiC Schottky diode. Highlights include the specificities of diamond devices and the benefits they might bring to power electronics applications. Gaetan Perez will be defending his thesis Monday 9th July at 10am in the amphithéâtre Bergès (RDC), Bâtiment GreEn-ER, 21 avenue des Martyrs, 38031 Grenoble.